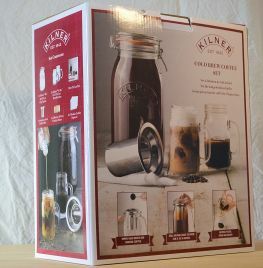 This Kilner Coffee Set : enables you to enjoy the delights of Cold Brew Coffee. The famous Kilner products are being revitalised into new walks of life based on their famous qualities for storage and Kilner airtight seal. This great Cold Brew Coffee Set has all the elements to help you experiment and come up with your own cold brew speciality drink. Cold Brew brings out different characteristics in the coffee with the Cold Brew process extracting a smooth rich flavor. The Kilner Cold Brew Coffee Set features a large 2L Kilner Clip Top Jar for steeping the coffee in. A stainless Steel Coffee filter which sits snugly in the top of the large jar. 2 Kilner Handle Jars for drinking your Cold Brew from!